Several recipes from my favorite bakery, Craftsman and Wolves in San Francisco, have been published on-line. These include a previous iteration of the cocoa carrot muffins, in cake form, and a sweet-savory apple gruyere scone. Both are delicious and definitely worth doing. I am hoping for the pear-yuzu croissant, the Rebel Within, and Valrhona chocolate chip cookie recipes to someday be published. Note to Chef William Werner: cookbook, please! – Thai scones and Chocolate coffee eclair on the Starchefs site here. – several recipes on Food and Wine, including chocolate peanut butter shortbread sandwich cookies recipe here. – update December 2014: C&W made it to the cover of the annual Bon Appetit Christmas issue with five recipes for Christmas sweets! Link here. And, the Valrhona Chocolate Chip Cookie recipe was finally published in 7×7 magazine here! Café Du Monde is the classic New Orleans institution for beignets and coffee. It is open 24 hours a day in the French Market area adjacent to the French Quarter. One can buy the beignets at a little take out window, but to get the full experience one should sit at one of the café tables to leisurely sip on coffee while enjoying the delicious, airy, freshly prepared beignets, buried under a mound of powdered sugar. They sell some popular souvenir items, including coffee mugs, beignet mix, and coffee at a slightly lower price than at some of the nearby souvenir shops. Everything is cash only. The French Market has a large farmer’s market selling all sorts of foodstuffs and a flea market. Southern Candymakers sells supposedly Bon Appetit magazine’s #1 praline. Try a free sample to decide for yourself (it was pretty good, even though I am not a big fan of pralines in general). Coop’s Place (found through Yelp) is a dive bar that also serves a full menu of New Orleans food. Their gumbo (thick and flavorful with shrimp, crab, and oyster) and fried chicken (spicy, much better than Popeye’s) were outstanding, but the rest of the items I had on the sampler platter (shrimp etouffee, jambalaya, red beans and rice) were just OK in my opinion. Cochon Butcher is a self-titled “swine” bar that serves sandwiches and small plates featuring their house-made charcuterie. This place was truly outstanding and my favorite in New Orleans. I went there four days in a row for lunch, since it is located only two blocks away from the Ernest Morial Convention Center, but I would seek it out as a destination even if not attending a convention. Every sandwich I tried was delicious. I loved that everything was house-made, including pickles and potato chips. The muffaletta featured a selection of tasty charcuterie, melted cheese, and olive salad on a toasted bun. Le Pig Mac – two all pork patties, special sauce, lettuce cheese, on a sesame seed bun, featuring their pork sausage. The Buckboard Bacon Melt – a ton of house-made bacon. The Cubano – the Cochon take on the classic. Pastrami Duck Sliders, a grilled cheese sandwich with brioche toast and duck pastrami. They also serve small plates, including an incredible pancetta mac and cheese, a boudin blanc sausage, a pork sausage stuffed with rice and served with mustard and pickles, and marinated Brussels sprouts. There are rotating sides, including cole slaw and cucumber salad. They also make a lot of sweet treats, including slightly underbaked cookies (I liked their white chocolate macademia nut and PB & J cookies) and a bacon praline, their version of the ubiquitous New Orleans candy. They also serve beer and wine and sell their house-cured meats, hot sauce, pickles, and t-shirts to take home. Butcher gets packed during lunchtime, especially when there is a convention, but the line moves pretty quickly. There is a small seating area inside as well as outside. Butcher is actually an off-shoot of the full-service restaurant Cochon a couple of doors down, which I didn’t try but would expect to be delicious as well. Highly, highly recommended. Cochon Butcher – link to website here. Restaurant August is a French fine dining restaurant from Chef John Besh, located in New Orleans’ Central Business District. They only serve lunch on Fridays, and in addition to their regular menu, they serve a 3-course prix fixe meal that is delicious and an outstanding bargain at $20.13. There are two choices of appetizer, entrée, and dessert. There was an amuse bouche of a roasted garlic custard, pumpkin, and pumpkin crumb served in an egg shell. For the appetizer I had their house-made lardo-wrapped pate, served with brioche toast. Duck rillete crusted drum (a saltwater fish popular in New Orleans) with Brussels sprouts choucroute and a creole mustard vinaigrette. The meaty rillette and fish was nicely balanced by the choucroute (sauerkraut) and the vinaigrette. The strawberry shortcake was an elegantly presented dessert featuring fresh strawberries, small triangles of shortcake, a key lime custard, vanilla ice cream, and Satsuma sorbet. A nice, light, delicious dessert. At the end of the meal, their was a gift of two delicious chocolate truffles. The service is highly professional. The main dining room is elegant. Restaurant August is a really well-executed fine dining restaurant. Highly recommended. My second favorite place in New Orleans. New Orleans has an incredible and distinctive regional food tradition. The Creole and Cajun styles developed from many influences, initially French, but also Portuguese, Spanish, Italian, and African that were adapted to local ingredients. Commander’s Palace and Antoine’s Restaurant are two fine examples of classic New Orleans Creole cuisine. I was excited to go to New Orleans, because this season of Top Chef was set in New Orleans. I was especially excited to visit Commander’s Palace, since one of the episode challenge was to re-create some of the restaurant’s classic dishes, developed by chefs such as Paul Prudhomme and Emeril Lagasse. Since it was on TV, I had to get the Shrimp and Tasso Henican appetizer. Shrimp are stuffed with tasso (simply put, Cajun ham) and flash fried, served with pickled okra and a hot pepper jelly. I thought this dish was a little bit too piquant, and probably should have chosen the more interesting and modern foie gras beignet. The menu is divided into a la carte options, a tasting menu, and a three course prix fixe menu. In addition to the shrimp and tasso dish, I had a prix fixe dinner. For the soup course, I had demi-tasse portions of three soups, the turtle soup, gumbo, and shrimp bisque. The turtle soup is a Commander’s classic. It is made with turtle meat, along with veal and about 30 other ingredients and takes three days to make. The soup is deep, rich, and complex, as is the gumbo. My favorite of the three was the creamy shrimp bisque. For the main course I had the Flounder “Haute Creole.” It was well-cooked but not particularly memorable, and I couldn’t really tell how much crab stuffing was there. The creole bread budding soufflé with bourbon vanilla sauce was my favorite part of the meal. The top of the soufflé caramelizes nicely over a light soufflé underneath and rich bread pudding at the bottom. The service very professional and attentive. Commander’s Palace is located among many stately homes in the Garden District. It is easily accessible by public transportation, a couple blocks away from the St. Charles street car. It is also directly across from the Lafayette Cemetery, one of the City of New Orleans’ fascinating and spooky above-ground cemeteries, with crypts dating back to the early 19th century. As an aside, I would recommend a tour to learn about the history of the city and cemeteries and the interesting funerary symbolism. There are several in the city, which are also great for photographers. Antoine’s Restaurant is located in the French Quarter and is the oldest continuously family-owned restaurant in the United States. The modestly-sized exterior façade hides a huge maze of rooms decorated with New Orleans history. I attended a group dinner where we shared several appetizers, vegetables, and desserts. I have to say that I thought the dishes were well-executed, but nothing particularly stood out. The trout pontrarchaine was good, a huge fillet of trout nicely cooked in butter and topped with a generous portion of lump crab meat. The service was very friendly. If one wants to seek out a classic New Orleans experience, I would probably recommend Commander’s over Antoine’s. But my favorite place I tried in New Orleans was more down-scale (coming soon). Recently I had the opportunity to revisit Boston and some of my favorite bakeries there. Clear Flour Bakery is a great neighborhood bakery established in 1983 that makes great French bread and pastries and rustic fruit tarts. My favorite is the morning bun, flaky with caramelized sugar and walnuts. Their baguettes are outstanding as are their seasonal fruit tarts. Mike’s Pastries in the North End serves classic Italian cannoli, cookies, pies, and cakes. They serve many different types of cannoli, with ricotta-based fillings flavored with vanilla, chocolate, or almond, dipped in pistachios, chocolate chips, or oreos. There are rum-soaked cakes and the dense ricotta pie. It’s definitely a calorie bomb. Flour Bakery and Cafe was established by Joanne Chang. From the original location in the South End, Flour has expanded to other sites in Boston and Cambridge. The breakfast sandwich was delicious with thick cut bacon and egg on a fresh roll. I am a big fan of the Flour cookbook. Finally, while on the East Coast I couldn’t help stopping by Dunkin’ Donuts! In Ottolenghi’s Jerusalem: A Cookbook, there is an illuminating short essay on the importance of hummus among Israelis and Palestinians in Jerusalem, the debate about its origins, and the arguments about which hummusia makes the best hummus. Ottolenghi’s basic hummus recipe starts from dried chickpeas that are soaked overnight. I tried to use a blender to make the hummus, but it was difficult to process unless in small batches. A food processor as recommended would work better. The hummus is great, smooth and fluffy, with the right amount of garlic, lemon juice, and tahini. 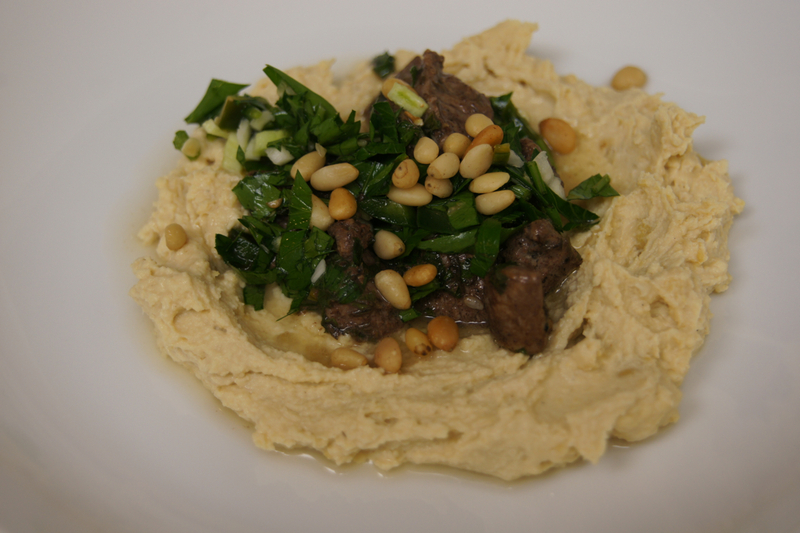 There are additional recipes in the chapter for lamb kawarma, a spiced, fried chopped lamb served over hummus, and musabaha (warm chickpeas with hummus). Link to Jerusalem: A Cookbook here.